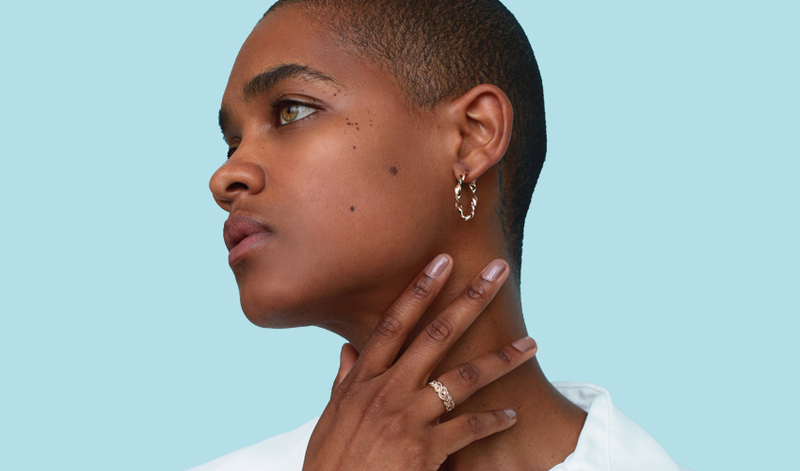 Hoop earrings have long been an essential item in your jewelry collection and this basic is getting upgraded with twisted hoop earrings. The new hoop style is a modern day twist of the classic 90s piece. Yes, the 90s are back in fashion again. This is good news for us fashionistas because comfort was key back then. Hence, the comeback of this simple and functional jewelry piece. You don’t need to dig around for the hoops you wore back then. Instead, buy fashion earrings after you read our tips on how to buy twisted hoop earrings. Read on to find your new jewelry basic quick. For basic jewelry pieces, we always recommend buying either a solid metal jewelry piece or a piece with gold plating. This rule definitely applies to twisted hoop earrings. With other hoop designs, we might challenge to play around with different materials but not this time. Twisted hoop earrings already have a special texture due to their design so you don’t need any added details. The only question you will need to answer for yourself is which metal color to choose. You can either choose the metal that best works with your skin and hair or simply go with the most common metal in your jewelry collection. The answer to both these options is probably the same. A silver or white gold piece stands out nicely with blond hair but also with dyed hair in colors like pink and mint. Yellow gold brings out brown eyes and darker hair colors. Rose gold is pretty much universally friendly. If you don’t know which metal works best for you then we recommend the softness of a rose gold. With any hoop earring, there is a different appropriate size for each occasion and dress style. Generally, as we go from the AM to the PM hours, the size of your hoop earrings can grow. Wearing twisted hoop earrings to the office is absolutely okay. 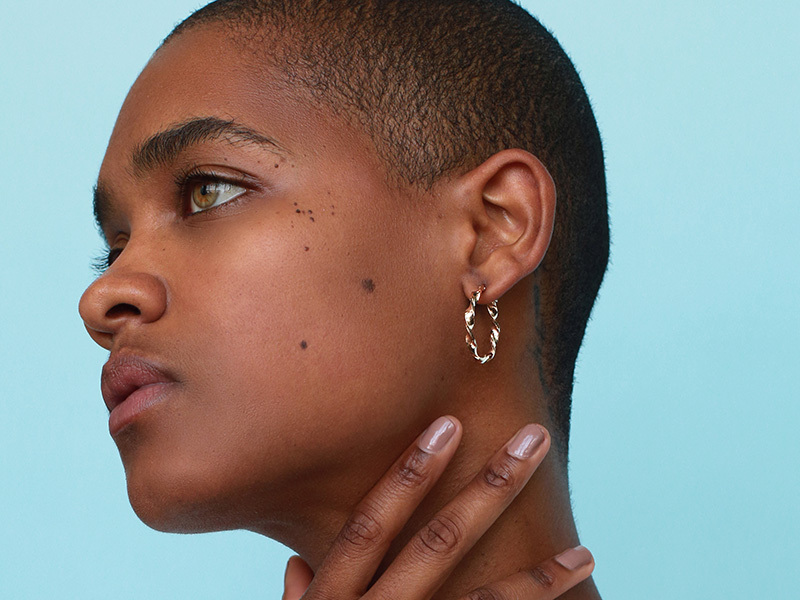 Hoop earrings will work for any office outfit as long as you choose the right size. Smaller is better in this case. Choose a pair that is a little chunkier to accentuate the twist in the earring. Don’t go so wide that they’ll get in the way, though. Holding the phone to your ear should not become a hassle. Your off-duty earrings can be large. The bigger the hoop, the thinner the design though. This keeps your face in balance. Another useful guideline is that the lower the neckline, the lower your twisted hoop earrings can drop. For special occasions, we recommend medium sized twisted hoop earrings. This way the earrings still give space for other jewelry pieces to grab attention. Also, medium-sized hoops will work with any hairdo. 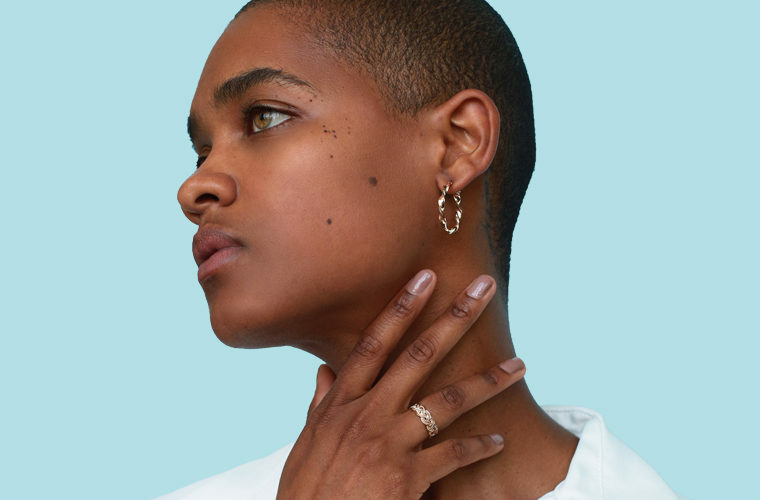 With the two most important aspects covered, we will leave you with some of our favorite styling tips for twisted hoop earrings. This look stays on the 90s track without looking outdated. Pair your twisted hoop earrings with a choker. Might as well go all out 90s for the jewelry. Wear a graphic top with a low neck to keep the attention to your jewelry. For your bottoms choose either boyfriend jeans or your favorite ripped pair with white sneakers. Twisted hoop earrings pair well with a strapless dress. Both your figure-hugging mini dress and flowing strapless maxi dress will look fab with these earrings. Pull your hair back to accentuate your shoulders and collarbone. You don’t need a necklace for this look but you can have fun with stacking bracelets and rings. Juxtaposing geometric lines creates a clean graphic look. Try wearing your twisted hoop earrings with a blue and white striped button down for your next business pitch. Striped rompers are also hot right now. This can be your summer to winter look by simply adding a long fuzzy sweater to the outfit. Bring back the circular shapes in your other jewelry pieces with a coin pendant necklace. If you’re like us, then you like to cover up as much as possible in the winter. A turtleneck or infinity shawl both look fierce with twisted hoop earrings. Bring your hair up in a ponytail or low bun so that your face is framed by the neckline and the earrings. Ready to try this twist on a classic jewelry piece? We’ve already got a pair in every size. Upgrade your jewelry basics with this design detail and instantly give your jewelry style a refresher. For more trending jewelry items, keep reading our other articles. Visit Ana Luisa online jewelry shop to view our amazing collection of gold hoop earrings.